Figured it was a nice day to trot out the herd and get some sweet social media likes. 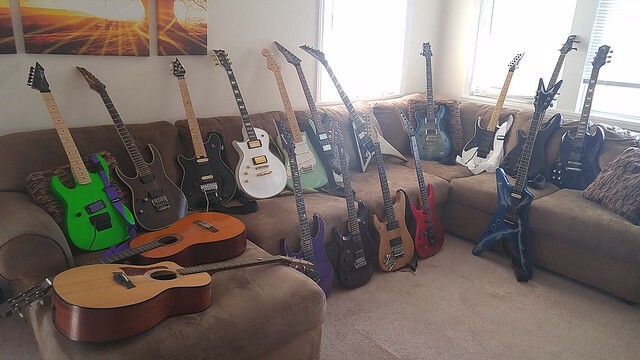 Guitars are Taylor 114 CE, Yamaha nylon string, BC Rich Retro Gunslinger with DiMarzio Super Distortion, Ibanez RG 721RW, EVH Wolfgang USA, ESP/LTD EC1000T DMZ, American Fender FSR Stratocaster, Platinum Series BC Rich Warlock with Duncan Custom/Jazz set, Jackson JS32 Rhoads with Duncan Solars, PRS Custom 24, 1987 Ibanez Rg550, Ibanez Soundgear bass, OSP SG copy with EMG 81, Dean Dime from Hell, Ibanez S540, Washburn N4 vintage, Ernie Ball Music Man JP6 John Petrucci signature model, Ibanez JCustom RG8570Z. This entry was posted on Friday, July 21st, 2017 at 3:16 am	and is filed under Lefty Ramblings. You can follow any responses to this entry through the RSS 2.0 feed. You can leave a response, or trackback from your own site.